Women don’t just wear pieces of jewelry – they inhabit them. Buying a piece of jewelry for yourself – a necklace, a bracelet, earrings, a brooch, something else – isn’t a task easily given to someone else. It’s often not a spur of the moment thing either. You just don’t rush off to the local boutique or the local Wal-Mart, grab whatever you see, and go home. I’m not talking about that impulse buy during your leisurely visit to the mall. I’m referring to purchasing those pieces of jewelry you know will have to do a lot of the hard work to accessorize your wardrobe and help you get the compliments and notice of your family, friends and c o-workers you comport with and compete with each and every day. No, buying a piece of jewelry for yourself is a multi-purposed moment, one which must be thought through carefully and one which must be savored. Lest you buy the wrong piece. That doesn’t really go with what you intend to wear. Or is over-priced. Or poorly made. Or conveys the wrong impression about status. Or is out of fashion. Or something one of your friends already has. The jewelry you buy has to conform to quite a long list of essential criteria before you could ever think of buying it. It is something you will wear more than once. As such, it is your companion. Your necklace is not merely lying around your neck. Or your bracelet around your wrist. Or your earrings dangling from your ears. Jewelry can cause you to lose face with others. It can irritate or scratch your skin, or get caught up in your hair. It might weigh you down or stretch or tear your ear lobes. Jewelry can break without warning in the most unexpected and embarrassing of places. It can get caught on things, sometimes hurting you in the process. Jewelry conveys to the world something about who you really are, or think you are. As such, jewelry is very personal. Your private, innermost, most soul searching choices made very public for all to see. As you caress it, as you touch the smooth or faceted or creviced beads and metal parts or the clasp or the material the beads are strung on, when you twist and move the piece within your hand, you are confirming to yourself the extent to which your jewelry is doing its job. When you buy new jewelry, the dilemmas multiply. How will the new compare to the old? Will it be able to handle all these responsibilities – looking good, representing you, fitting in with your wardrobe, meeting the expectations of others? Like divorcing, then remarrying, changing your jewelry can take some time for readjustment. And you do not want to be seen as noncommittal to your jewelry. This would sort of be like going to a hotel, but not unpacking your suitcase while staying in the room. Conveying some sort of social or psychological distance from your jewelry can be very unsettling for others. So you need to inhabit it. You need to inhabit your jewelry, wear it with conviction, pride and satisfaction. Be one with it. Inhabiting jewelry often comes with a price. There becomes so much pressure to buy the “right” pieces, given all the roles we demand our jewelry to play, that we too often stick with the same brands, the same colors, the same styles, the same silhouettes. We get stuck in this rut and are afraid to step out of it. Or we wear too many pieces of jewelry. The long earrings, plus the cuff bracelets on both arms, plus the head band, plus the hair ornament, plus the 7-strand necklace, plus the 5 rings. We are ever uncertain which piece or pieces will succeed at what, so hopefully, at least some combination or subset of what we wear will work out. In a similar way, we wear over-embellished pieces – lots of charms, lots of dangles, lots of fringe, lots of strands. Something will surely be the right color, the right fit and proportion, the right fashion, the right power statement, the right reflection of me. And our need to inhabit our jewelry comes with one more price. We are too willing to overpay for poorly made pieces in our desperation to have that right look. The $100.00 of beads strung on elastic string. The poorly dyed stones which fade in the light. The poorly crimped and overly stiff pieces with little ease for accommodating movement and frequent wear. It is OK to inhabit our jewelry. In fact, it is necessary, given all we want jewelry to do for us. But we need to be smart about it. We need to learn to recognize better designs and better designers. This need not be expensive at all. I emancipated myself from my upwardly mobile position, after 18 years of progressively more responsible positions, having attained an annual salary the income taxes from which supported one whole government worker. And what did that do for me? Emancipation. Over the next 20 plus years of starting all over again. At the bottom. Learning another trade. Having no accumulated reputation or power or wherewithal to get ahead. I had freed myself to make my own choices. I had painted myself into a picture of my own dreams. To be an artist. To make jewelry. To play with beads. And to make a living at it. Take a Moment To Read…. Chilled Morns and Eves Warmed by Fall’s Soulful Colors, Stylish Clothes, Sophisticated Thinking, and Layered Looks. Nostalgia – for changing leaves, apple cider, turkey and dressing, family gatherings, office parties, warmth by the fire. Fall is all about presenting a more elaborated side of you to the outside world. Work and play. Online and off. Jewelry to tell the world to open up, you’re coming in from the playful summer heat. 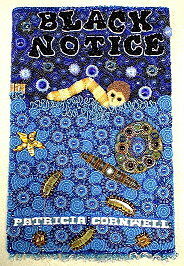 Visit the web-pages of each of our 4 Beaded Tapestry Competition Semi-Finalists. Evaluate their images, their write-ups, and their materials and techniques. Use of Beads in the Design. The judges were blown away by the quality of all 4 semifinalists. It was truly amazing how well each artist captured the essence of their book. Each artist brought these books to life within their book cover design. Yet each artist’s approach was different. 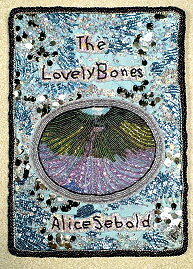 These artists should commend themselves on the amount of thought, insight, and coordination of ideas and techniques which went into producing their Beaded Tapestry pieces. Bravo! 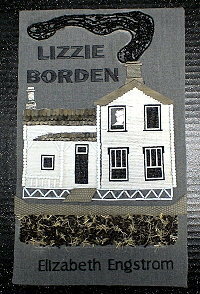 Here we use the concept of “Tapestry” in its broadest sense as a stitched, sewn and/or woven wall hanging. Your tapestry may be woven, loomed, stitched, quilted, cross-stitched, crocheted, knitted, sewn, braided, knotted, embroidered, macrame’d, beaded and the like. Your tapestry will combine fibers/threads/and/or cloth and beads in some way, and the surface area must consist of at least 70% beads. 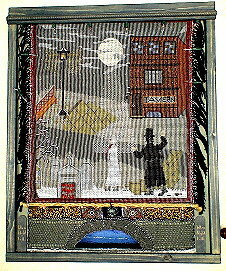 Beads may be used in many ways, such as forming the background canvas of your piece, and/or embellishing your canvas, and/or as fringe, and/or as stitchery covering parts of your piece. Your piece should be mounted or framed in some way, ready for hanging on a wall. Your tapestry may utilize many different techniques. 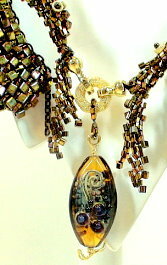 The DESIGN PERSPECTIVE is very focused on teaching beaders and jewelry makers how to make choices. Choices about what materials to include, and not to include. Choices about strategies and techniques of construction. Choices about mechanics. Choices about aesthetics. Choices about how best to evoke emotions. These choices must also reflect an understanding of the bead and its related components, and how all these pieces, in conjunction with stringing materials, assert their needs. Their needs for color, light and shadow. Their needs for durability, flexibility, drape, movement and wearability. Their needs for social and psychological and cultural and contextual appropriateness, satisfaction, beauty, fashion, style, power and influence. This DESIGN PERSPECTIVE contrasts with the more predominant Craft Approach, where the beader or jewelry maker merely follows a set of steps and ends up with something. Here, in this step-by-step approach, all the choices have been made for them. And this DESIGN PERSPECTIVE also contrasts with another widespread approach – the Art Tradition – which focuses on achieving ideals of beauty, whether the jewelry is worn or not. Here the beader or jewelry maker learns to apply art theories learned by painters and sculptors, and assumed to apply equally to beads and jewelry, as well. The Craft Approach and the Art Tradition ignore too much of the functional essence of jewelry. Because of this, they often steer the beader and jewelry maker in the wrong directions. Making the wrong choices. Exercising the wrong judgments. Applying the wrong tradeoffs between aesthetics and functionality. The focus of the DESIGN PERSPECTIVE is strategic thinking. At the core of this thinking are a series of design principles and their applications. These principles provide the beader and jewelry maker with some clarity in a muddled world. The belief here is that, since there are so many different kinds of information to be learned and applied, it is impossible to clearly integrate this information all at once. When learned haphazardly or randomly, it becomes too difficult or confusing to bring to bear all these kinds of things the beader or jewelry maker needs to do when designing and constructing a piece of jewelry. Thus, the beader and jewelry maker best learn all this related yet disparate information in a developmental order, based on some coherent grammer or set of rules of design. This is the DESIGN PERSPECTIVE. So, we begin with a Core set of skills and concepts, and how these are interrelated and applied. Then we move on to a Second Set of skills and concepts, their interrelationships and applications, and identifying how they are related to the Core. And onward again to a Third Set of skills and concepts, their interrelationships and applications and relationship to the Second Set and the Core, and so forth. In the DESIGN PERSPECTIVE, “Jewelry” is understood as Art, but is only Art as it is worn. It is not considered Art when sitting on a mannequin or easel. Because of this, the principles learned through Craft or Art are important, but not sufficient for learning good jewelry design and fashioning good jewelry. Learning good jewelry design creates its own challenges. All jewelry functions in a 3-dimensional space, particularly sensitive to position, volume and scale. Jewelry must stand on its own as an object of art. But it must also exist as an object of art which interacts with people (and a person’s body), movement, personality, and quirks of the wearer, and of the viewer, as well as the environment and context. Jewelry serves many purposes, some aesthetic, some functional, some social and cultural, some psychological. The focus of the DESIGN PERSPECTIVE is on the parts. How do you choose them? How should they be used, and not be used? How do you assemble them and combine them in such a way that the whole is greater than the sum of the parts? How do you create and build in support systems within your jewelry to enable that greater movement, more flexibility, better draping, longer durability? How do you best use all these parts, making them resonate and evoking that emotional response from your audience to your style, vision and creative hand that you so desire? The beader and jewelry maker is seen as a multi-functional professional, similar to an architect who builds houses and an engineer who builds bridges. In all these cases, the professional must bring a lot of very different kinds of skills and abilities to bear, when constructing, whether house or bridge or jewelry. The professional has to be able to manage artistic design, functionality, and the interaction of the object with the person and that person’s environment. Enter: The Ugly Necklace Contest – A Jewelry Design Competition With A Twist!